Apr 2008: Pieces of Jewel Kilcher is online again, as it was when it went off. If I could find the time, I hope that it will be re-built to reflect the changes in events and Jewel's career. Music and the web is a different animal than it was. Jewel has changed and so have I. This site was a passion and a learning experience for me, just as Jewel learned as a performer. I run another online company so I never left the web, I just changed my homepage. Old news: Watch for future replays of the amazing HBO series, the Sopranos for a Jewel reference. Christopher knocks off a Jewel benefit show for Amnesty Int'l at Rutgers University, only to find that most students use their id cards instead of cash. Old news: Jewel appeared on the ABC Bill Maher's Politically Incorrect late show on Wednesday November 8th. Jason Alexander (George on Seinfeld), Laura Innes (ER) were co-guests. Old news: Free Jewel on Halloween! But you had to be amongst some ghouls to see her. She performed on Halloween at a Democratic Pres. Rally at Westwood Village (UCLA) in Westwood, CA..
Old news: Interested in Jewels' political views? Read this statement from her. It is the view of Jewel only and does not necessarily represent the views of this website. PoJ is 12 yearsold !! This is a piece of history and like history, it should be preserved. So this site is still here as it once was. Of course, I look at it and think, ugh. It could be this or that. And some pages have frames! But hey. This is what is was back when. This site was before days of Google and blogs and pre-flash corporate crap dotcom bubble bursting mp3 playing blow your ears ipods. Not too many left like it was in the old days. Old news: Jewel is evaluating her options for a producer or possibly to self produce her next album. Let's hope it's soon. It's been a long while. Old news: And now for something completely different.... Foolish Games was covered as a high tempo dance number by Marina on MKR Records. Sample it here. Old news: The lyrics engine has been improved. New songs are being added, like Serve the Ego, Break Me, Violet Eyes and Stephenville. Old news: Jewel Chat: A live chat with Jewel was held at MSN on Thursday Oct 19th at 7:00pm EDT. The chat is over and here is a transcript of what transpired. Old news: CBS The Jewel Network: Jewel performed the debuts of a strange little diddy called "Serve the Ergo" on the CBS Late Show with David Letterman Oct. 6th and a song called "Shadows Play" on the October 7th CBS Saturday Morning Early Show. Old news: Many people have inquired about the song Jewel performed on the View at the start of October. 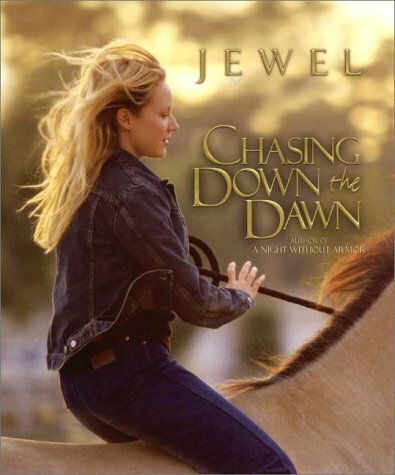 It's actually a 11 month old song called "Break Me"
Old news: Jewel's second book was"Chasing Down The Dawn" and you can order it in any of several variations. The tracklist of the audio version is not on the package, so here it is. Old news: Did you catch Jewel on Leno October 12th? Looking back on unknown artists that this site has featured in past years, much of the list has done quite well including: Fiona Apple, Beth Orton, Texas, Tara MacLean & Patti Griffin. PoJ Note: Stay linked for some very cool new things being added to this site soon. As well, as the re-tooling of some dear old ones that have made this site special on and off over the last 10 years.